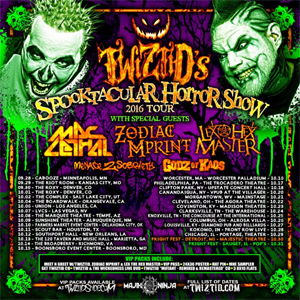 11-time Billboard chart-topping duo TWIZTID kick off their massive 2016 Fall tour, the "Spooktacular Horror Show", today in Minneapolis, MN! The tour will visit 30+ cities before coming to a close on Halloween night in Sauget, IL. Joining TWIZTID on stage will be live drummer Drayven of DAVEY SUICIDE/STATIC X/GENITORTURERS, who has previously performed behind the kit as drummer for THE WICKEDNESS, TWIZTID's full live band. The "Spooktacular Horror Show" tour features special guests MAC LETHAL, ZODIAC MPRINT (Blaze and The R.O.C. ), LEX THE HEX MASTER, MENAGE 2 SOBRIETY and GODZ OF KAOS. Tickets and VIP Packages are on sale via www.Twiztid-Shop.com. VIP Packages include a pre-show Meet and Greet with TWIZTID, ZODIAC MPRINT and LEX THE HEX MASTER. They also include a VIP pass, 24x36 poster, hat pin, Majik Ninja Entertainment sampler, Get Twiztid CD, Mutant Remixed And Remastered CD, TWIZTID live DVD and three black and white 8x10 promotional photos that VIP's can get signed by TWIZTID at the VIP Meet and Greet. See below for currently confirmed "Spooktacular Horror Show" dates. TWIZTID's upcoming 12th release, entitled The Continuous Evilution Of Life's ? 's, will hit stores on January 27, 2017. The album will be the duo's second released via their own Majik Ninja Entertainment label and pre-orders will go live on Black Friday - November 25, 2016 via www.TwiztidShop.com. The Continuous Evilution Of Life's ? 's will feature 12 all new tracks, primarily produced by longtime TWIZTID producer Seven. However, the new album features four tracks with a clear hard rock influence - a crossover genre TWIZTID has successfully dabbled in for over a decade - produced by famed goth rock frontman Davey Suicide and his keyboardist Needlz. An official tracklisting will be revealed soon.